Apple will continue its crusade against the ultra-vulnerable Adobe Flash soon, blocking the plugin by default starting with the next version of desktop Safari. Flash will still be allowed to run, but the user will have to activate it on a site-by-site basis. Apple is following in the footsteps of Google, who announced last month that upcoming Chrome versions will act similarly although Chrome will give exceptions to major websites. 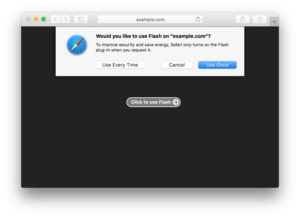 In addition to Flash, Apple is also blocking other plugins like Silverlight and Java, although neither has been as prone to security issues like Flash has been for the last decade. V-sweepers are best for quick, smooth and smart dry cleaning of large areas like halls with less labor effort and time. Scissor action makes them perfect for commercial use. For optimum cleaning they are available with 100cm acrylic mops and frame has two color options (Blue & Golden) as per your cleaning needs.